The official opening of the Russian pavilion at the 54th International Art Exhibition - la Biennale di Venezia took part on June 2, 2011. In 2011, Russia is represented by Andrei Monastyrski and the Collective Action group (A. Monastyrski, N. Panitkov, I. Makarevich, E. Elagina, S. Hänsgen, S. Romashko, until 1983 - Nikita Alexeev, until 1989 - G. Kizevalter) selected by curator Boris Groys. Pavilion Commissioner: Stella Kesaeva, President of Stella Art Foundation. The "Empty Zone" multimedia exhibition is deployed in 5 halls of the pavilion and it is an attempt of a flashback to "Collective Action" activities. The central hall exhibits a new large-scale installation by Andrei Monastyrski "11" made especially for the Russian pavilion. It is built on references to the historical and topological contexts and is based on the materials of earlier CA's actions. The Minister of Culture of the Russian Federation Alexander Avdeyev visited the official pavilion opening. 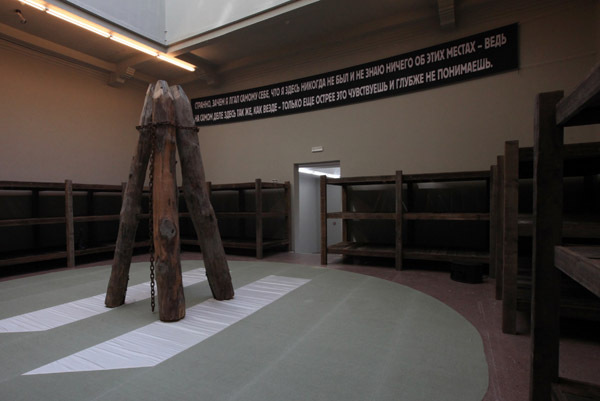 In total, more than four thousand people visited the exhibition during the first days of the Biennale. The exhibition is open until November 27, 2011.